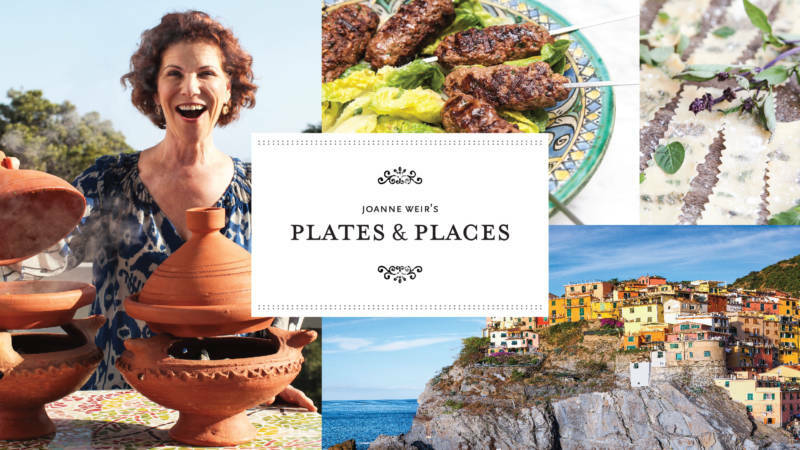 By popular demand, we bring you 13 brand new episodes of JOANNE WEIR’S PLATES & PLACES! Get ready to take a culinary journey with Joanne through flavorful destinations, from just down the road to across the globe! In Season 2, Joanne is clearly on a mission. Going beyond the recipes, she explores the traditions, techniques and stories behind some of her favorite dishes and adds their inspiration to new creations. From discovering aromatic fresh spices in the vibrant souks of Morocco to cruising the Rhine River to find an entire museum devoted to mustard, to preparing a simple, yet modern fish stew with a chef on the pristine island of Kea in Greece, Joanne shares inspiration from people and cultures from around the world. Ever the cooking teacher, Joanne brings the flavors home to make dishes with readily-available ingredients and techniques that are easy to grasp. Each episode is packed with fascinating detail, gorgeous scenery, and enticing flavors. Joanne travels to Marrakech, where she discovers a potter who makes a tagine pot large enough to serve ten! And then she joins her students to create individual tagines and fires up braziers to cook them outdoors. In Northern California, Joanne visits a sustainable caviar farm for a tasting of a lifetime and then shares how a few dollops of caviar can turn homemade pizza into a celebration! Then it’s off to Italy, where a little rain can’t stop her from finding the secret to creating Venice’s small bites, called Cicchetti, that pair so nicely with a bubbly Venetian Spritz! Joanne takes you to the spectacular castle-filled Middle Rhine Valley, a UNESCO World Heritage site. She visits the Heidelberg Castle and makes some of her favorite local dishes. We also visit Rüdesheim am Rhein to taste some of their famous locally-made brandy. Recipes: Herb Spätzle; Pork tenderloin with red onions, cabbage, and apples. Joanne visits a potter in Marrakech, Morocco to learn how the classic tagine pot is created, and then her students make traditional tagines over open-flame braisers. Back in her San Francisco home kitchen, Joanne makes two more tagine variations al fresco. Recipes: Sea Bass Tagine with fennel peas and potatoes; Lamb Tagine with Artichokes, Preserved Lemons and Olives; Preserved Lemons. Joanne takes you to a hilltop in the spectacular Eastern Washington Mountains to cook an amazing beef tenderloin and Cabernet-inspired feast. Back in her home kitchen, Joanne makes a tangy dry rub flank steak with charred tomatoes and corn salsa. Recipes: Potato Rosemary Harvest Bread; Beef Tenderloin Roulade with Pistachio, Parsley and Lemon Zest; Roasted Harvest Vegetables; Dry Rub Steaks with Charred Tomato and Corn Salsa; Grilled Steak, Potato, and Herb Salad. Join Joanne as she visits one of the most romantic destinations in the world. We visit the Rialto Market where Venetians have bought their food for almost a thousand years, then take a break at a bacaro for a glass of wine and a tasty snack. Back in her San Francisco kitchen, Joanne teaches you how to bring the flavors of Venice to your home. Recipes: Polenta Triangles with Shrimp Saor: Polenta; Venetian Spritz. learn how to elevate several recipes with this extravagant ingredient. Recipes: Celebration Pizza with Smoked Salmon and Caviar; Devilish Eggs with Caviar. Joanne takes you to the source of some of her favorite spices, a quintessential spice soukin the markets of Marrakech. Later, Joanne finds luck in a hidden corner of the Medina. Back in Joanne’s kitchen, we learn how to create authentic Moroccan dishes with a little help from the spice shop. Recipes: Chickpea Soup with Ras El Hanout; Ras El Hanout Almond Brittle; Tangerine Semifreddo with Salty Ras El Hanout Almond Brittle. Join Joanne as she explores the seafood specialties of Greece. We visit Kefalonia Fisheries in Athens and travel to the small island of Kea to see the freshest fish become an amazing stew in a portside restaurant. Joanne brings the flavors back to her home kitchen to create an amazing modern fish stew. Recipes: Fish and Shellfish Stew; Herb Roasted Whole Fish. Today in Amsterdam we visit the farmers market in the Noordermarkt and taste the hugely popular dish of pickled herring. Back home in San Francisco, Joanne teaches us her family pickling recipes. Recipes: Homemade Sauerkraut; Mama’s Garlic and Dill Pickles; Pickled Asparagus. Travel to Morocco with Joanne and her students and learn how to make the paper-thin pastry dough Warka and the classic sweet and savory Bisteeya. Then join Joanne in her kitchen as she makes several traditional warka dishes. Recipes: Warka with a Brush; Sweet Bisteeya; Triangles and Cigars with Spiced Shrimp Filling. Recipes: Chocolate Hazelnut Tart; Salted Bittersweet Chocolate Pot de Crème. After a quick breakfast featuring traditional Msemmen bread, we travel to the Atlas mountains to experience the rustic Berber Market. Back in San Francisco Joanne teaches her student, ballet soloist James Sofranko, how to make Msemmen and a pizza in the home kitchen. Recipes: Msemmen flatbread; Moroccan “Pizza” with Cilantro and Preserved Lemons. Travel with Joanne and her students to the Greek Isle of Kea where they learn how to make tomato bread, stuffed peppers, and roasted lamb. Then join Joanne back in her home kitchen where we make our versions of some Greek Classics, including a salad Joanne remembers from her very first trip to Greece. Recipes: Stuffed Peppers; Roasted Lamb; Tomato Bread; Lamb Sirloin; Tomato Breadsticks; Greek Salad with Caper Leaves. Recipes: Upside Down Roasted Chicken with Vegetables; Warm German Potato Salad. American Public Television (APT) is the leading syndicator of high-quality, top-rated programming to the nation’s public television stations. For more than 10 years, APT has annually distributed one-third or more of the top 100 highest-rated public television titles in the U.S. Founded in 1961, among its 250 new program titles per year, APT programs include prominent documentaries, performance, news, and current affairs programs, dramas, how-to programs, children’s series, and classic movies. America’s Test Kitchen From Cook’s Illustrated, Cook’s Country, AfroPoP, Rick Steves’ Europe, Chris Kimball’s Milk Street Television, Front and Center, Doc Martin, Nightly Business Report, Midsomer Murders, A Place to Call Home, Lidia’s Kitchen, Globe Trekker, New Orleans Cooking with Kevin Belton, Simply Ming, and P. Allen Smith’s Garden Home are a sampling of APT’s programs, considered some of the most popular on public television. APT licenses programs internationally through its APT Worldwide service. Entering its 13th year, Create®TV — featuring the best of public television’s lifestyle programming — is distributed by American Public Television. APT also distributes WORLD™, public television’s premier news, science, and documentary channel. To find out more about APT’s programs and services, visit APTonline.org.